Happy birthday to Connor...aaaaaaaaaaand he'll be lucky to live to his next one at this rate. I kid, I kid. I still love him. But 90 minutes of playing hard to catch wasn't exactly how I wanted to spend my Thursday evening. He was awful. Just like on Sunday, he essentially spent the entire hour and a half cantering, galloping or trotting around me. The worst part, besides the fact that he hasn't been this hard to catch for me since November, was that he wasn't even remotely respecting me. I never got an ear, never got him to turn to me when I stopped walking and invited him to come in, and never had his attention. I was an afterthought. I got to the barn at 6:30pm and caught him just after 8pm, as my semi-private lesson was ending - Chad had the ring all to himself tonight. By the time I caught him (only after a fellow boarder brought his best friend over to the fence), his pulse and respiration rates were through the roof, and he was dripping sweat. To be perfectly honest, looking back on it, it WAS a decent workout for building cardiovascular endurance. He was mostly kept in probably the 70-80% heart rate percentile except toward the end where he may have hit 90%, and there were frequent walk breaks. That said, there were tears in my eyes as I walked him down. My stress relief was my stressor today. Afterward, my trainer stopped me and said that this isn't a new thing, that they've been having problems with him for a while, and that something needed to change. I readily agreed; I was so embarrassed and miserably stressed over it already, and hearing that made it so much worse. She's been so wonderful to me with letting me work off some board and everything, and I repay it with a horse that inconveniences her and all of the barn help? Not cool. We made a plan, though, and hopefully things will get better. Finally, one good thing came of tonight. I mentioned that his grazing muzzle would be here by Saturday, and she said, "Do you think he's fat?" I didn't even have to think about my response, the words came tumbling out in one big run-on sentence: "No! I've talked to his breeder and a woman who events her Cob prelim and Cobs get sort of fit/fat when they're in shape and he's entering his six year old year when he's going to spring a bit anyway and he's developed muscle and yes his ribs are hard to feel but he has no tailhead fat and I think he looks good." She replied that she agreed that he's at a good weight, and was unaware that he had been taken off his feed. The relief I felt when she said that was immense. I've been told he's fat like it's going to kill him tomorrow, seen it written on the board and generally been peer pressured into second guessing myself on my own horse. Even tonight someone mentioned they thought he was at risk of laminitis/founder. I'm mad at myself for second guessing myself, but then, I'm feeling a little unsure of myself at the barn lately. I know my horse, and I know this breed. 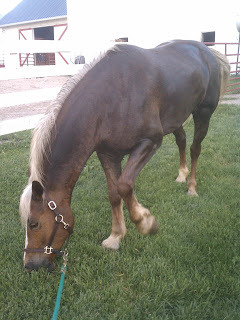 Weight management and cheeky stubbornness...I did buy a pony, after all. I love him all the same, but I hope we can find a way to lick this hard-to-catch thing once and for all. He's not fat, he doesn't look fat in the slightest. He looks good. I've been giving you a hard time, but out of fun. 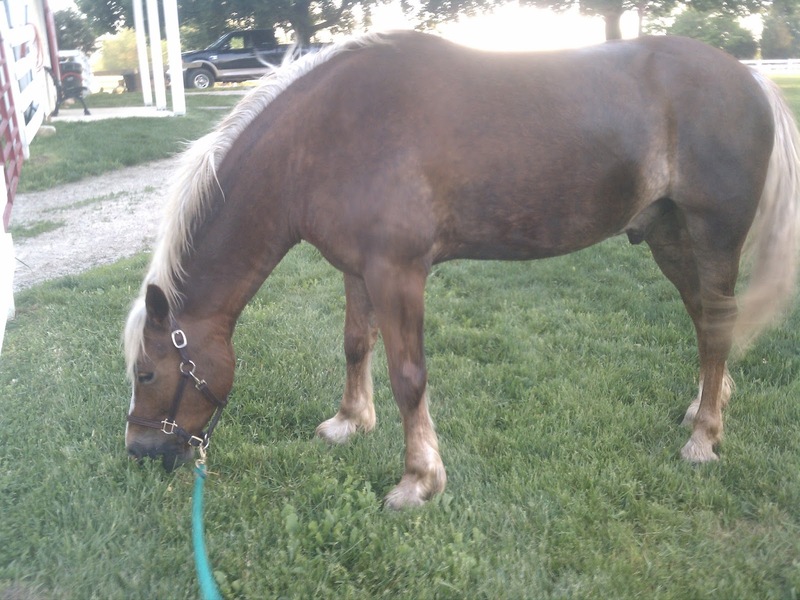 Don't let anyone with a skinny horse tell you he's fat. My thoroughbred looks like him right now, and that's because he's covered in muscle, but Guinness looks skinnier because of the lack of bone in his legs. Not fat. He is not fat, but a muzzle does help keep the weight off. Rosemary was muzzled even pregnant and is muzzled now when on grass and she is not fat either. Our vet said to watch Roscoe when he turns 2. Just watch him. I have your horses half brother. I feel your pain.